Best and aspirational practices significantly reduced sediment and nutrient concentrations and runoff compared to common practices in mixed sugarcane and capsicum production. However, there were yield reductions associated with the practices that delivered these water improvements. Further research is required in order to maintain improvements in runoff water quality while also maximising yield. Improved land management practices have the capacity to increase farm efficiency as well as minimise the flow of nutrients, sediments and chemicals into the waterways. The Burnett Mary Paddock Monitoring Program is monitoring the impact of different land management practices on off-site water quality. This trial is monitoring sugarcane and regionally significant intensive horticulture cropping systems where a one-year vegetable break is included between sugarcane crop cycles. The trial, located near Bundaberg, ran from July 2010 to June 2013. This case study focuses on the first phase of the trial, from December 2010 to January 2011, measuring different soil and nitrogen management practices during capsicum production. 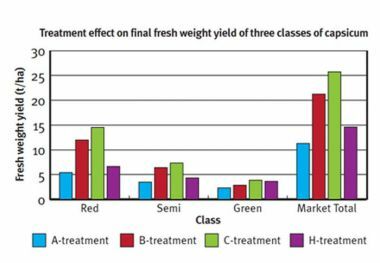 Five mixed cropping treatments were applied at the trial site in 280 metre by nine metre plots on a sandy loam soil. Subsurface trickle irrigation was used on the treatments (except New Farming System). Flumes collect samples from each strip to quantify runoff and sediment movement. Parameters measured during capsicum growth include runoff water quality and quantity, drainage water quality, crop productivity and soil and plant nutrient dynamics. Common practices (Treatment C) - conventional tillage, plastic mulch and standard fertiliser recommendations. Cane trash removed by burning prior to capsicum planting. Best practices (Treatment B) – full tillage and plastic mulch, reduced fertiliser application with an in-season, inter-row vegetative mulch. Cane trash removed by burning prior to capsicum planting. Aspirational practices (Treatment A) - minimum tillage with direct capsicum transplanting into a sprayed out cane ratoon after green cane harvesting, trash mulch and reduced fertiliser applications. Aspirational continuous vegetable system (Treatment H) - permanent beds with Rhodes grass to generate surface mulch prior to capsicum establishment; other management practices similar to Treatment A. New Farming System (NFS) - standard soybean-sugarcane rotation with trash retention, minimum tillage and controlled traffic. 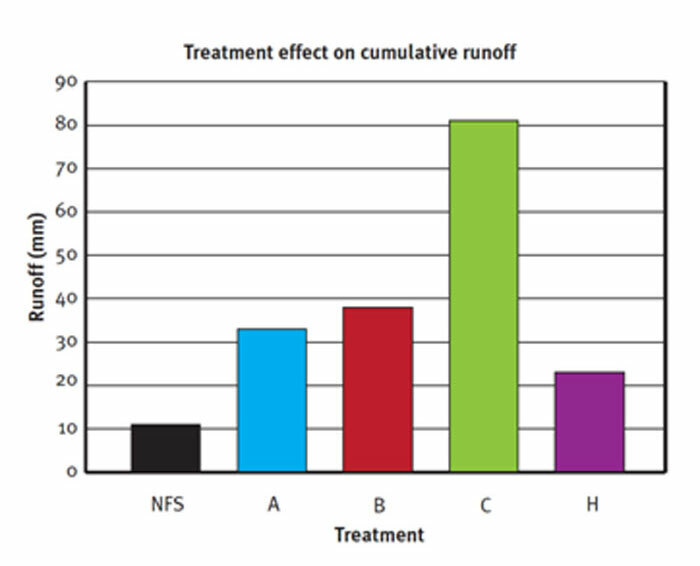 Common practices (Treatment C) generated the highest runoff volume and total sediment loss in runoff water. The dissolved phosphorus, nitrate and ammonium concentrations within runoff water were also higher in Treatment C compared to Treatments A and B. 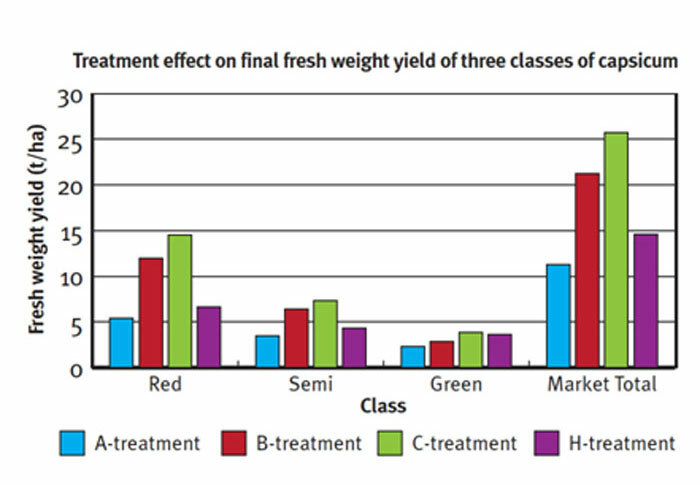 Runoff from December 2010 to January 2011 was 81 millimetres for Treatment C. Best practices (Treatment B) and aspirational practices (Treatment A) reduced runoff volume by 54 per cent and 60 per cent, respectively. Total sediment loss in runoff water over the period was significantly lower for best practices (29 kilograms per hectare) and aspirational practices (10 kilograms per hectare) compared to common practices (149 kilograms per hectare). Results indicate the open cane trash mulch system (Treatment A) reduced runoff but increased deep drainage and nutrient leaching, increasing the risk of groundwater contamination. Despite having more runoff and less deep drainage, the higher nutrient inputs in common practice still resulted in elevated soil nutrient concentrations at 1.2 metres in post-harvest sampling. This was well below the effective rooting depth of vegetable crops.